An exhaustive history examines one of the most significant battles of World War II. The extraordinary battle in Hosingen, Luxembourg, between American and German troops remains sadly neglected, despite being one of the most significant engagements of the war, according to the author. When the 110th Infantry Regiment set up camp in the town, its purpose was largely to rest, and the unit was pleased to find Hosingen relatively unscathed by the war, and hospitable. But Hitler, preparing for a massive resurgence of his battered army, set his sights on Bastogne, the way to which cut right through Hosingen. The Americans established a defensive position, and in December 1944, fought the Luftwaffe for nearly three days, despite being greatly outnumbered and inadequately equipped. Hosingen was considered to be so strategically significant, Gen. Troy H. Middleton and Gen. Norman D. Cota ordered the men to “Hold at all costs!” American soldiers fought bravely against a force of 5,000, and ultimately wounded or killed 2,000. Nonetheless, on Dec. 18, the regiment, out of both ammunition and food and encircled by the enemy, had no choice but to surrender. This is the second book by Flynn (Unforgettable: The Biography of Capt. Thomas J. Flynn, 2011), and her father figures prominently in this one as well, since he was the executive officer of K Company during the defense of Hosingen. The prose is reliably limpid, and the author’s command of both historical context and tactical maneuvering is stunning. While a scrupulously researched study, the book possesses cinematic power, unfolding more like a work of fiction than an arid catalogue of the past. 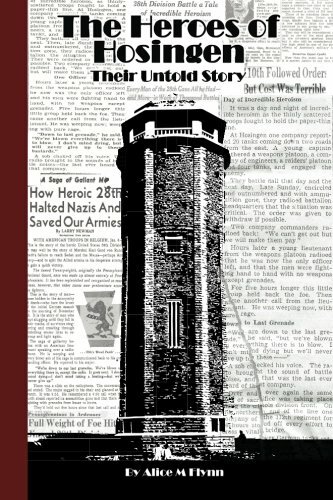 Many of the men who surrendered suffered terribly at the hands of their captors, and the author covers this as well, providing the perspectives of eight prisoners of war. Sometimes, the reader may feel crushed under the weight of so much minutiae—Flynn even provides lists of casualties by name—but the action is vividly described, making up for any information overload. The volume also includes a wealth of black-and-white photos, and appendices that include newspaper articles from January 1945. This is history at its best: thoughtful, rigorous, and dramatically presented without embellishment. An important contribution to World War II literature.